Startup OKC is a 3-day event during which teams of participants pitch ideas for new startups. They then form teams around the ideas presented, and work the entire weekend to build an MVP (minimum viable product), identify customers, refine MVP, market research, customer validation, refine MVP, validate, business model & rollout strategy, pitch prep & finally on Sunday evening. Pitch! Throughout the weekend you will have opportunities to network with other teams and other individuals participating in Startup OKC. Mentors will be in and out throughout the weekend. Our mentors are some of the best and innovative minds from around Oklahoma City. We begin with open mic pitches on Friday where attendees have ONE minute to pitch their best ideas and inspire others to join their team. Anyone is welcome to pitch their idea. Teams will organically form around the top 7-8 ideas determined by attendee votes, and participants get started on creating a startup! Saturday and Sunday teams focus on business model creation, customer development, validating their ideas, practicing LEAN Startup Methodologies and building a minimal viable product. On Sunday evening teams demo their prototypes and receive valuable feedback from a panel of experts. On average, half of Startup OKC’s attendees have technical or design backgrounds, the other half have business or non-technical backgrounds. Early Bird - Order early and get a discount, hurry while supplies last! Pitch & Presentation Night - Can't attend the full weekend event? Join us for dinner and drinks on Friday for pitches and/or Sunday for the final presentations to show your support for and be energized by the teams. Participant Sponsor - For our returning participants who know what a transformative experience a single weekend at Startup OKC can be and are willing to support it by providing an over and above donation. This will also land your name on our sponsor page as an individual donor and earn you our deepest gratitude. Scholarship Sponsor - Can't attend the event but understand the positive impact it has on participants and our community? Sponsor another attendee and support the cause! Startup OKC wouldn’t happen without local businesses taking part. We want to promote your business and help you grow as you help these future entrepreneurs and business leaders grow in their startup journey. If you want to be a part of OKC’s most exciting startup event, please have a look at our sponsor page. Please read the FAQ's below the schedule for more information about Friday night pitches and Sunday night presentations. If you have questions about the event or are interested being a sponsor, email us at info@startupokc.com. Does everyone have to pitch an idea Friday night? Nope! But we hope you do! You can pitch an idea you've been thinking about for a while or an idea you thought of last minute that you think of on Friday. It's great experience to pitch to a room of people and get your message across in only 60 seconds. If you don't want to pitch, no problem! Be ready to vote on the best ideas and join a team for the weekend. Can I pitch an existing business? NO. This competition is for teams to work on an idea from the ground up and is not for existing businesses. Good rule of thumb: if you have a website, a product or even a prototype, your idea is too far along for Startup OKC. If you've done some preliminary research on your idea to help craft your pitch Friday night, that's completely fine! The reason it's important for the idea to still be in the idea stage is that the team that forms around your idea should be instrumental in helping that idea come to life over the course of the weekend. If you want to have 100% control of your idea and you just want to attend to get people to work on it for free, this is not the event for you. Can I pitch any idea? Any ideas are eligible, but the event is tech-oriented. So the majority of ideas are mobile or web-related. We recommend that whatever the idea is, you come up with some type of tech-focused component since a portion of the judging criteria on Sunday is execution and design, usually through the development of a minimum viable product. Again, Startup OKC is for new startup ideas only. The team that forms around an idea will be instrumental in helping that idea come to life over the course of the weekend. If you already have a website, a product or even a prototype, your idea is too far along for Startup OKC. What makes a good 60 second pitch on Friday night? What is the judging criteria for Sunday presentations? Here’s the judging criteria for Sunday presentations. How does the team plan on making this a successful business? Have they thought about competition, how to scale, acquiring customers, their revenue model, etc? Did the team get out and talk to customers? What is the value proposition to customers? Are teams building something that people actually want? Am I expected to participate the entire weekend? Yes. This is a weekend-long competition. The organizers have participated in and organized several weekend-long startup competitions, and it's absolutely critical to the teams' success and the value that each participant gets out of the weekend that everyone participates the entire weekend. Is it a lot of work? Absolutely. Will it interfere with any other plans you have that weekend? Absolutely. Is it worth it. ABSOLUTELY. We'd encourage you to ask past participants what their experiences were like or post the question on our Facebook page so past participants can give you their opinions on the weekend. I have a conflict that weekend. Can I still check out the event? The Startup OKC community definitely wants you involved! In order to be a participant, you will need to participate then entire weekend. If you cannot participate, feel free to come Friday night to network and watch the :60 pitches, then come back Sunday night to watch the presentations. We'll open up a special ticket type 3 weeks before the event if you want to swing by to watch Fridan and/or Sunday night. You can reach out to us through Eventbrite, email us at info@startupokc.com, or post a question on our Facebook page. We're happy to refund your ticket purchase up to 1 day before the event. It is our job to provide you with an incredible networking and learning opportunity. Our intention is that you meet some amazing people that you might actually start a company with, build relationships with coaches, and learn from your peers. The event is intended to be a collaborative forum for sharing, learning, building, and having fun. As such, by registering as a participant, you acknowledge that any ideas shared by you or anyone else over the course of the event are contributions to the overall experience and community. If you as a participant are worried about someone stealing your ideas, please reconsider your participation in the event itself or simply refrain from sharing specifics about your idea. Here's our stance: Ideas are worthless. It's all in the execution. And to execute, you need a team. 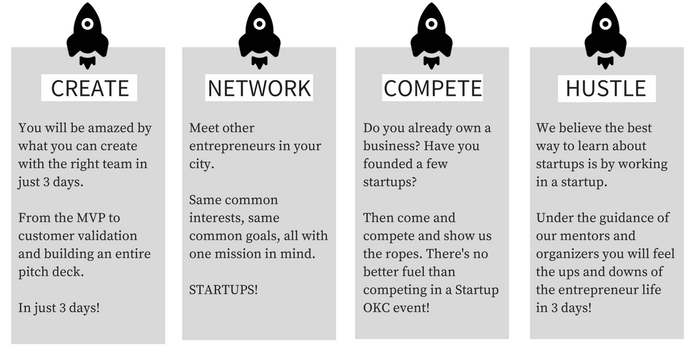 You can find team members at Startup OKC events. As a member of your startup community, you agree to be inclusive of any and all people and their ideas. You agree to act professionally, treat everyone with respect, and treat the event facilities with proper care. You agree that you are responsible for any accidents or damages that you cause. You also agree to not hold Startup OKC, your volunteer team, or any of the event supporters liable for any loss, damage, injury, or any other unforeseeable incident. By Participating at the event, you grant Startup OKC permission to capture photo/video of the event. By submitting your information above you consent to receive email communication from Startup OKC and its programs about events and updates that may interest you.